SMITHFIELD, Va., Mar. 29 /CSRwire/ - Smithfield Foods, Inc., and Food Lion have partnered for the second annual Easter Eats donation, a Food Lion Feeds initiative to provide Easter meals to families facing hunger. Together, Smithfield and Food Lion delivered a total of 300 Easter meal bags each containing a Smithfield ham and an assortment of sweet potatoes, green beans, corn, cornbread stuffing, carrots, brown gravy mix, and more. Part of Smithfield’s and Food Lion’s shared mission to alleviate hunger and address food insecurity across the country, the Easter Eats donation served families in need at two donation events: one in southeastern Virginia and the second in central West Virginia. 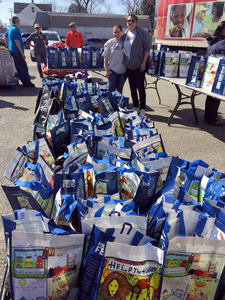 The first of two Easter Eats donation events took place in Kearneysville, West Virginia, where Smithfield and Food Lion delivered 150 meal bags to the local community during a mobile donation event at Leetown Baptist Church community facility. Smithfield and Food Lion distributed the remaining 150 meal bags to those in need during a second mobile donation event in Norfolk, Virginia, with help from the Food Bank of Southeastern Virginia and the Eastern Shore. Volunteers from each of the participating food banks assisted with the preparation, packaging, and distribution of the donations. The Easter Eats donation supports Food Lion’s pledge to provide 500 million meals by the end of 2020 through its Food Lion Feeds program. To date, the company has already donated more than 377 million meals. Smithfield’s contribution was part of the company’s Helping Hungry Homes® initiative. Since the program’s inception in 2008, Smithfield has provided more than 100 million servings of protein to food banks, disaster relief efforts, and community outreach programs nationwide.